Now that the dust has settled, the grid been decided and then altered with the Toyotas and Hamilton sent to the back, and the Williams protest against Ferrari and Red Bull been withdrawn, we can begin to take a long view of qualifying to see if there are some answers to the questions of the off season. And the first imponderable is that the Brawn GP car really is as good as it promised to be. Throughout qualifying, Button and Barrichello were in a league of their own, battling each other out front. The fact that cars without the double-decker diffuser came close to them shows that it is not just the extra downforce at the rear that is making the difference - the Brawn is good in other areas too and will probably remain competitive even if the team is ultimately forced to run with a conventional diffuser. As has been said many times, that has to be at least partly thanks to the long preparation the team has put into the car and that is confirmed by the BMW (minus KERS and a fancy diffuser) being a strong contender as well, the team having worked on their 2009 challenger almost as long as did Honda. But it is not the whole story. Brawn GP has managed to produce the best car in spite of very limited testing - and we have seen in the Hondas of previous years and the MP4-24 McLaren how the computers and wind tunnels can get it very wrong. Another thing that screams at me from the qualifying sessions is that KERS has proved itself more of a hindrance than a benefit. Having more ballast with which to fine tune the handling of a car is clearly more important than a six-second boost of power on the straights - just ask Nick Heidfeld, who narrowly missed getting into Q3 while his KERS-less team mate wound up fourth quickest. But it was not just the Beemers that showed how pointless is KERS; the Ferraris and McLarens, both running KERS, would have been grateful for a little more ballast to offset the advantage of the double-diffuser boys. I am not saying that KERS was the cause of McLaren's problems but it certainly complicated the matter of improving the car's handling. It would not surprise me if the teams currently running KERS were to quietly dump it for the next few races or even the whole season. Were testing still permitted, they could work on finding a decent balance with KERS fitted but that possibility has now gone. The easiest solution is to get rid of it. I sympathize with those who prefer to see fuel strategies unfold during the race but the publication of the weights of the cars does reveal a lot that we can talk about. As an instance, we can see that Kubica set his Q3 time with the lowest fuel load of all, whereas Heidfeld has been topped up to be the second heaviest. Robert will be the hare, it seems, while Nick must defend his position (now elevated by the Toyota penalty) until the pit stops hand him an advantage. It is apparent, too, that the Brawns were not light on fuel and so we have more confirmation of how good the car is. The Ferraris are a bit light, which might give Mark Webber (immediately behind them on the grid) two or three extra laps to get by during the pit stops. Nakajima has gone for a strategy similar to Heidfeld's whereas Hamilton is light, obviously hoping to be quick enough in the early laps to pick up a few places. It will be interesting to see how the various strategies pan out on Sunday. Finally, I want to look at something pointed out by Hezla in the comments to my previous post - BMW's apparently overconfident policy of holding their drivers in the pits until quite late in each qualifying session. The strategy ruined several of Heidfeld's qualifying chances last year in that it gave him no leeway to make up for even a slightly-botched lap and one has to wonder at the philosophy behind it. This year it seems sheer madness. The ban on testing during the season means that the teams have to use every minute of practice to try new tweaks and this squeezes the time available for setting up the cars. Naturally, this means that there is still fine tuning to be done in qualifying and precious little time to do it in. Surely the best policy would be to set a banker time early in each session and then attend to any handling issues that crop up. I could be wrong on this one - after all, Dr Mario must know what he is doing. But it leaves me in an agony of frustration in every qualifying period, begging the Beemers to come out while they sit, apparently twiddling their thumbs, in the pits. Everything is so upside down that nothing can be relied upon. Regarding BMW you are absolutely right: the old rules do not apply. I have to wonder if those who run the KERS systems now will have an advantage when the systems start to make the difference (if that should happen). I wasn't surprised to see Nick using it. He tends to cut his own swath which enables him to gain an advantage sometimes (like an early change to 'wets' or running heavy on fuel). It should be interesting to see how KERS plays out. In terms of the quality of the show, it was absolutely delicious to see last year's lead teams falling to the midfield while customer teams take up the front of the grid. Williams & Brawn GP are wonderful teams to watch. Too right, Marc - it is great to see different teams fighting for the best positions. McLaren and Ferrari have had years at the top and now it looks as though Brawn and Williams are having their turn. Money doesn't always win - you need good ideas as well. It's great to see some new teams battling it out at the top of the order, and even more interesting to see the apparent disadvantage KERS is bestowing upon those cars running it. As a Webber fan, it's very encouraging to see the pace of the Red Bull - even though a mistake in Q3 cost him a better grid spot. It looks like Red Bull have the quickest of the conventional diffuser cars at the moment. Apparently the unique design of the RB5 will make adapting a double deck diffuser difficult should it be deemed legal, which is why Christian Horner has been so vocal in his criticism of them. If the half second advantage the tricky diffuser supposedly gives is wiped out, Horner could just about be running with the Brawns. Red Bull is the team that had me fooled through testing - I thought their car was not as good as the Ferraris and BMWs. Vettel and Webber have shown it to be even better and, as you say, it could be the car to watch if Brawn have their diffuser taken away from them. It does make me wonder about the Toro Rossos, however. Same car but nothing like the same performance. Are we seeing a reverse of fortunes last year (perhaps Renault have extracted a bit more than expected from their tweaks to the engine) or is it merely a case of less able drivers? Perhaps time will tell. Sorry to feel your pain Clive regarding the BMW's even though I am not a fan of them. They are underachieving and might not maximize the advantage they will be enjoying for the next five races. And that considering that they had their car ready to go way ahead of the others except for BGP including KERS - maybe that was a mistake on their part? Which brings me to Red Bull. Man - I am not a fan of these guys either but aren't they impressive? The speed of the car its looks and its performance? But Webber is just one of those rare sportsmen who will never get that lame duck off his shoulders and certainly not with Vettel around. Williams, really not such a fancy looking car. It seems to work though. How I would wish for them to be battling it out at the top but come to think of it I wouldn't enjoy the ulster I would be conceiving having to relive Williams F1 sabotaging themselves with really bad strategies and even worse pit stops as I remember the the Damon Hill v Schumacher years. Poor Nicoh he deserves the best what a great kid, great sound bites and awfully honest with those too. Remember how shocked he was witnessing Schumacher's parking shenanigans in Monaco? Thank you, Michael. I am not too disappointed with BMW now that the race has been run. Kubica was quick enough to stay with the lead cars - his collision with Vettel was a racing accident, I think and he will not always have bad luck. Nick's race may have been ruined by the first corner incident but he kept going and finished the race. The car was damaged and not as quick as it should have been but, even so, his quickest lap was only three tenths slower than Kubica's. So I expect the next few races will see BMW doing much better. The Red Bull is obviously working well and surely Mark Webber's luck can only get better. 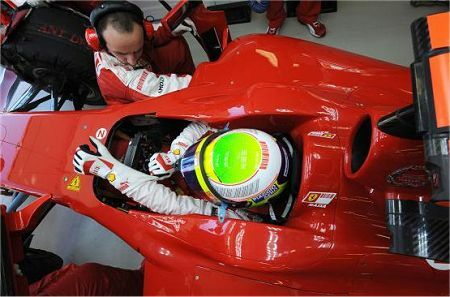 And I do feel that the stewards punished Vettel unfairly after the race. Finally, I must agree with you about Hamilton - he has proved himself yet again to be a supreme racer.